Homemade applesauce. Sounds complicated, right? WRONG. 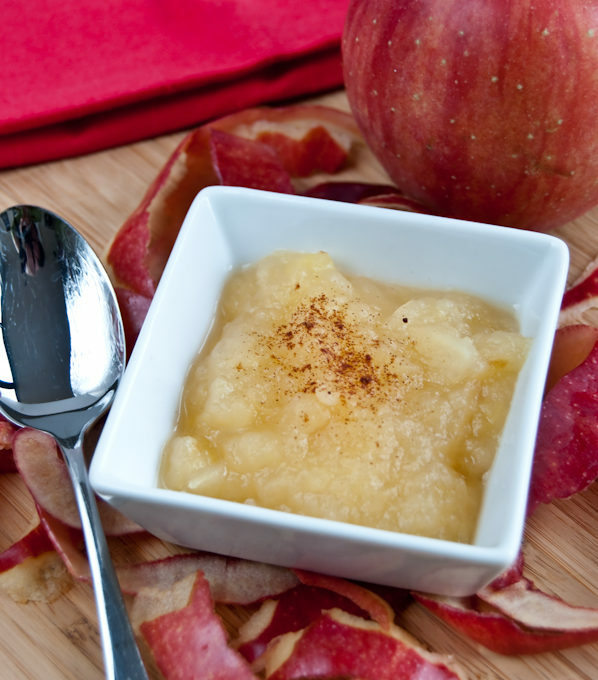 If you can use a peeler and turn on a burner, you can make applesauce. It’s really just that easy. But first, what kinds of apples make the best applesauce? If you ask Stacey’s grandma she’ll tell you Granny Smith are the only apples to use. Don’t tell grandma, but we use a variety of apples – from McIntosh to Gala to Pink Ladies. Check out the U.S. Apple Association’s Apple Usage Chart for other kinds recommended for making sauces. Once you have your apples picked out, peel the skin off 6 of them and save the skin for snacks. Apple skin is full of fiber and nutrients. Next, dice the apples and put them in a pot, 3 qt. or larger. Six medium-sized apples make about 3 cups of sauce. Add about ¼ cup of water to the pot, put on the lid and heat on medium-low. Stay nearby to make sure it doesn’t boil over. It takes about 15 minutes for the apples to break down and be easily mashed. An immersion blender also does the trick. Stir in about ¼ cup sugar and mash a bit more. Grandma recommends adding in a spoonful of pink-hued jelly or cranberry sauce and cinnamon for color and flavor. If you’re serving it to your baby, just leave out the add-ins. If there’s no time for the homemade variety, look for store bought jars labeled unsweetened 100% applesauce. 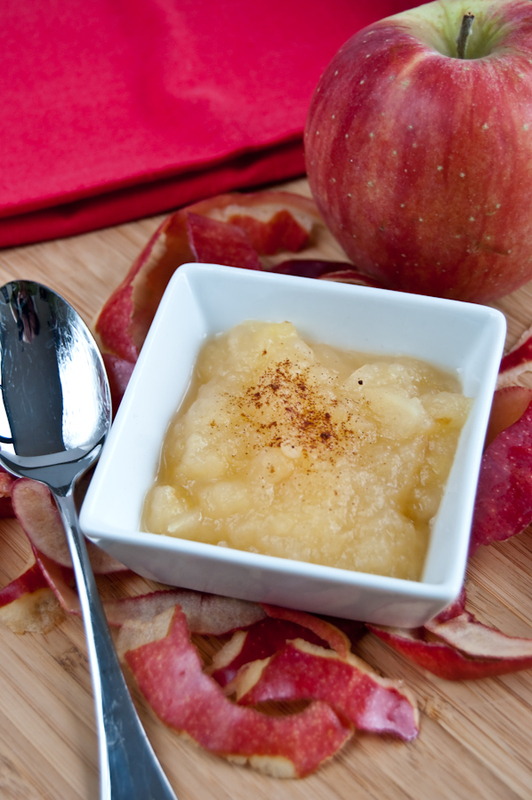 Store bought applesauce can always be sweetened at home with cinnamon, honey or maple syrup. An apple a day is pretty good advice after all. Apples have a high content of antioxidants – flavonoids to be precise. Flavonoids have been linked with decreasing risk for certain diseases, primarily cancer. If you’re interested in some more in-depth reading, check out this 2004 research article discussing the relationship between apple consumption and decreased risk of disease. It may be surprising to know of the research into apples and health, and the U.S. Apple Association lists summaries of some key studies here. How Stacey Got the Shot:.ISO 400, focal length 42mm, f/5.6, 1/60 second. Natural light, diffusion material over the window, silver reflector at camera left, white foam core behind the subject. everyfoodfits.com » Fired Up for Fall!